An entry-level Ethernet version of the popular TSP100 futurePRNT printer. Ethernet is the connection method of choice for hospitality and retail environments requiring fast, long distance, reliable communication. However this extremely flexible choice of connection has always come at a cost. 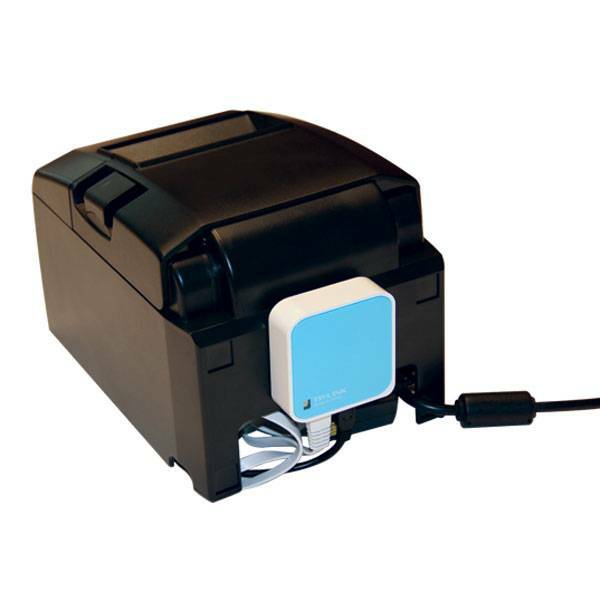 This is no longer the case, the TSP100LAN is the world's first dedicated Ethernet receipt printer available at virtually entry-level pricing. The TSP100LAN offers this flexibility at a low cost with a simple, fast network connection using standard CAT 5 cabling combined with futurePRNT software and simple installation procedures. Using the Star "Keep Alive" Feature, the TSP100LAN will negotiate with any networked host and automatically print an error if the connection is lost due to PC / Hub failure or cable damage with immediate warning to the remote location that the printer is offline. Now the NEW Star low cost WiFi Power Pack offers simple WiFi printing directly from Tablets, PCs or any other Mobile Device to any Star LAN printer. A low cost wireless LAN solution which is modular, easy to upgrade with quick intuitive set-up. The WiFi Power Pack is designed to make any Star LAN interface printer “wireless” in a cost effective way without a lot of messy cables. The WiFi Power Pack connects via Ethernet and acts as an adaptor to send/receive the wireless signal from your wireless network. This, in turn, makes the device using the WiFi Power Pack able to connect with tablets, smart phones and other portable electronic wireless devices.